Make sure your content is timely. If a disaster strikes and your charity responds then create a noticeable banner ad on your homepage. This way people can quickly donate without having to weed through a bunch of stuff they don’t have time to read. “Do Good” donors are attracted to banner ads that present urgent needs. Showcase your brand promise in a banner ad on your homepage. If you want to improve your results, then you must incorporate “Scan-ability” in your creative execution. This is no truer than with your artwork online. People scan Web pages in a Z. Therefore put your opening line top left and closing thought bottom right. However, there is a Magic Square, that is found if you divide the page with two vertical lines and two parallel lines, the eyes tend to move to the intersection on the top right first. 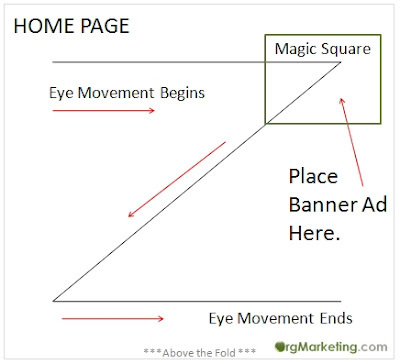 Banner ads placed on the "first screen" in right hand corners (Magic Square) usually receives two times more "clicks" then banner ads on the top or bottom of the page. You will notice that many great painters put the action of their paintings in what is called the Magic Square. Reference a book called the Secret Formulas of the Wizard of Ads by Roy Williams. The book is invaluable in learning to communicate and becoming a great marketer. Therefore, put your essence statement or tag line to the top left, action shot (banner ad) top right at the Magic Square, and your close or call to action bottom right. That is the magic formula; now go create some magic for your charity.